If you ask me what I came to do in this world, I... will answer you: I am here to live out loud. my annual film-cation ended last night! what a ride - now it is back to reality from 10 days of reel-ity. in the past on the mouse, i listed and summarized the movies i saw at the festival; however this year i'm going to modify tradition and simply give a rough account of my reel-life travels. to list and summarize all of the 44 films (and 10 shorts) i viewed would take too long especially considering that i put real-life on hold for the last ten days and i really need to get my head out of the clouds! the cleveland international film festival (ciff) is a true celebration of international filmmaking - more than 60 countries were represented this year at the festival, my personal cinematographic journey took me to more than 25 countries. even though i visited all the continents, my own viewing habits seem consistent with ciff's particular strength- ciff is renowned for showcasing and supporting films from central and eastern europe and eleven films i choose to go to came from this region of the world. perhaps this is due to my own czech/slovak heritage. in fact, the first film i saw was a german-polish collaboration. despite the scores of films that came afterwards, winter's daughter remained in my festival top ten list. it is a wonderful moving family drama and an inter-generational road trip film. fortunately none of the films i saw were losers all though there were a couple that didn't live up to my expectations. looking at my list of films seen, it appears that i lean toward dramas - 26 films i saw were primarily dramas; and 9 films could be classified as comedies (although most of these so called comedies were infused with significant dramatic aspects - such as come as you are which is also on my top ten list); and 9 films were documentaries. i don't think i could choose one film as my festival favorite - instead i've constructed a top ten list. for film lovers out there consider these films ones i enthusiastically recommend, although a couple of them are definitely not for the faint of heart. like most favorite lists - what you see above is today's list - if asked in a week the list may very well be different. there are a handful of other films which i can't get out of my mind - for instance women with cows, a swedish documentary about two elderly sisters that is most affecting and visually arresting; tomorrow will be better, a unique road-trip film about 3 russian homeless boys who seek a better life in poland; and, found memories (from argentina and brazil) and nana (france) two narrative films with are gorgeous visually poetic reflections on different stages of life. 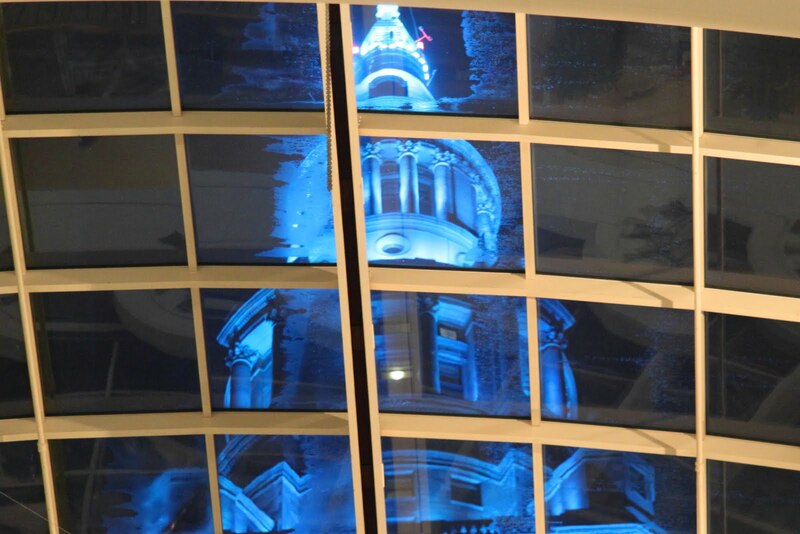 photo: terminal tower as seen through the skylight during last night's festival closing night party held around the fountain in tower city, cleveland. We bought the album when it debuted. I guess it was a CD. I know it's close to 20 years ago. This song brings on the memories, nostalgia and a bit of melancholy. What an awesome photo, mouse! I think I would collapse after seeing so many films. I admire your abilities. "Tyrannosaur" is a terrific film -- I saw it here in the UK. As you noted, it is definitely not for the faint of heart! I'm glad it's making the rounds in the U.S., though.